If you haven’t already done so, you’ll need to install the free Google Text to Speech service. Click here to install it. It’s inevitable. You’re driving down the road, and you get a text message. What to do, what to do. You can read it – that takes your eyes off the road briefly. But… what if you need to respond? Can you pick up groceries? Make a quick call? Stop and pick up the kids from the mall? You can text back a response. Dangerous. Trying to type while driving is a pain. Maybe your text message app accepts voice and transcribes it? That’s a little better, but you still have to click on the text field, then find the tiny microphone icon, speak your message, then read it to see if it was correctly transcribed, then press the send button. Of course, you’re about out of luck if there was a transcription error. You have to try and delete the message and start over. You could call. But that means more button pressing, locating the contact, getting to the right phone number, pressing the call button. Enter Texty Driver. Massachusetts, like many states, has outlawed texting while driving – and for good reason! As I wrote above, it’s distracting. So the Texty Driver app is voice command driven. You can setup 3 frequent texters and with one button press, activate the texting sequence. First, it states the name of the contact you are about to text and tells you to speak your message. When you are finished, just stop talking. 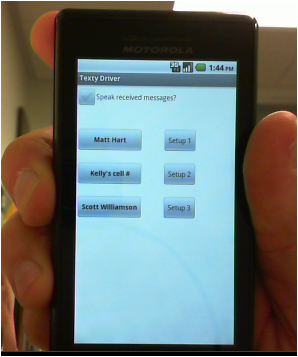 The Android operating system on equipped phones, such as my Motorola Droid, will connect to servers and transcribe the message. It’s very accurate and works well even in road-noise environments. Second, your transcribed message is read back to you. That lets you confirm the accuracy of transcription without looking away from the road. You can respond with “Yes”, “No” or “Cancel”. Yes sends the message, with a voice confirmation. No starts the transcription over, letting you speak your message again. Cancel stops the process. If the app is kept running, there is an option that lets it speak received messages back to you. If one of the selected contacts responds, the app will convert the message to voice and speak it. However, App Inventor doesn’t currently allow applications to run as background processes, so it won’t speak if something else is running, or if the phone is locked.